Bake a sheet cake the size that you need. 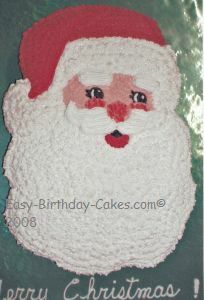 With an icing filled bag and round tip, size #5, draw Santa claus's face on the cake top. Cut the cake away from the Santa's face shape. Do the eyes first. Use round tip, size #5 and black icing and outline the eyes and make two lashes on each. Also do the black circle in the eye, and the black of the mouth. Use white icing and the same size round tip and fill in the white part of the eyes. Next, do the white hat band and the ball at the end of the hat using the star tip, size #18 and white icing. Now sprinkle white edible glitter over these. Make a flesh colored icing (a tiny amount of pink and yellow) and do the round cheeks under the eyes. Also do the nose making the nose two layers so it is higher. Now sprinkle these with red edible glitter. You will be using the star tip,size #18 for all the rest of the face with the flesh colored icing. Make a red icing and fill in the hat and the lip. Use white icing and fill in the beard. The eyebrows are made using the same star tip and making two short lines above the eyes. The mustache is done next in the same manner only drawing curved lines. If you have made a Santa Claus cake that you would like to share, please submit your cake here and let us know how you made it! We would love to feature your cake on our site. Please make sure to include a photo of your cake and a description of how you made it, so that we can all share ideas and learn from each other! See Santa Claus Cakes That Were Submitted By Others To This Site!